Because it is finally finished. And I have to say this final bit was all Mr. H.C. The only share I had in this last wall was painting one coat of paint on the door. There won’t be too many words about this, because words cannot describe how completely and utterly finished it looks. Unfortunately photos can’t do it justice either. Because it is all painted in Sherwin Williams’ lovely creamy white color — Steamed Milk. The same color as the kitchen walls. The same color as the dining room walls. The same color as the living room walls. The same color as the ceiling in all those rooms as well. Yes, we like creamy white walls. And ceilings. In my humble non-decorator-just-average-person opinion, creamy white walls make a humble cottage look bigger, lighter and brighter, and just all-around more cheerful. And anyone who saw the cottage before, with its orange walls and wallpaper and 70s dark paneling would agree. One can see that it is so new, there isn’t even any art on the walls. Not only does the floor have a level problem, there are also some serious cracks. It was the coldest week of the winter, 2015 when we laid the tile in the mudroom. There’s a lot to look at here — but you can see the shadow of the old entry door. You can also see the wires going across the wall above the doorway. …and here is the doorway, framed in. And the pocket door painted and closed. Here at the top, you can see the secret hinged cover that opens to allow access to the wires. The sliding door that covers the electric panel is made from concrete board and trimmed with wood grain concrete board so it mimics the other interior doors in the cottage, but it is safe for being next to the wood stove. It hangs from the ceiling with pocket door hardware. 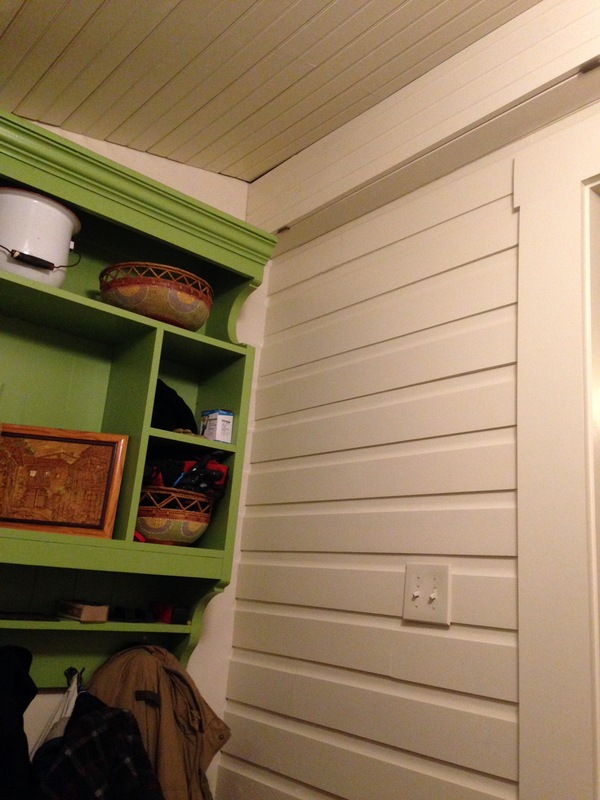 One of the best things about having the mudroom finished is that now the doorway into the kitchen is finished as well. 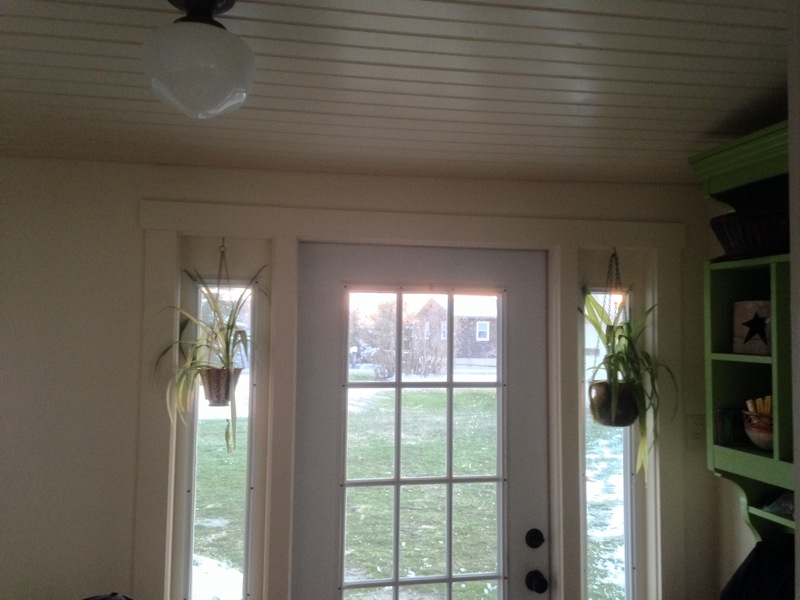 In the last post on the mudroom, I showed you the photo on the left. Now the far right is the finished picture. 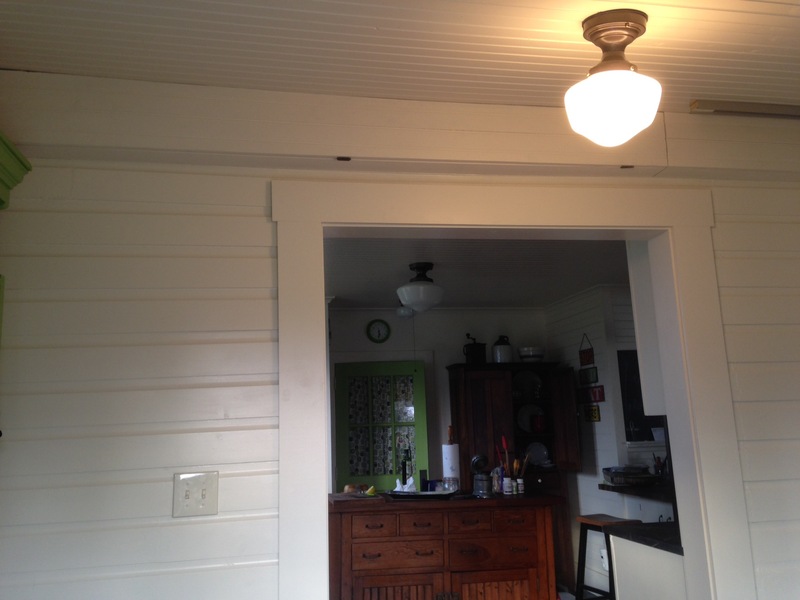 Finished and Unfinished…On the left is the finished kitchen….On the right is the only unfinished wall of the mudroom. Trim on the kitchen doorway is finished. Five rooms down, two to go. Three if you count the back porch; four if you count the laundry room. Earlier this summer several of us were cleaning a commercial kitchen at a children’s camp before camp started for the summer. There was a lot of grease… everywhere. I had been using a natural cleanser of my own — orange vinegar, sometimes with baking soda — which I like a lot, but this one is way better! I liked it so much, I went to the dollar store and bought my own clean spray bottle for it, instead of just using a hand-me-down bottle. Mix all the ingredients and pour into a 16 ounce spray bottle, and get to work on that greasy stove top. I’ve been using a green cleaner in my dishwasher, but I really don’t like it much. The glasses are cloudy when they come out, and the silverware doesn’t always get clean, even though I rinse my dishes in hot water before I load the dishwasher. I know it’s a waste of water, but I don’t want food collecting in the bottom of my dishwasher. And that’s the bottom line. So I was delighted when I found this oh-so-simple recipe for dishwasher soap. I remember reading that homemade dishwasher soap was an issue, because Mother-in-Laws come to your house and inspect your glasses for spots. Well, guess what? This is a mother-in-law proof recipe! Here’s my glass bowl, fresh out of the rinse cycle. And here’s one more cleaner I love to spray on my countertops — both wood and soapstone. It is also a disinfectant, so it’s good for sinks and toilets too. And it is reputed to keep ants away. I can’t say about this for sure. What I can say is that it might work. I sprayed around Henry the Cat’s food bowl when I started seeing ants there, and now the ants are gone. But I’m also being careful to keep it cleaner and his food swept up better. Not only is he the King of Cats, he is the King of Slobs when it comes to the food bowl department. Mix together in a spray bottle and shake well before every use. I use a bottle that has a mister option, and I love this cleaner for two reasons: the cinnamon in it smells terrific, and the peroxide in it foams up on contact with dirt, so you can tell it’s working. Use an opaque spray bottle — there’s a reason peroxide is sold in brown bottles. 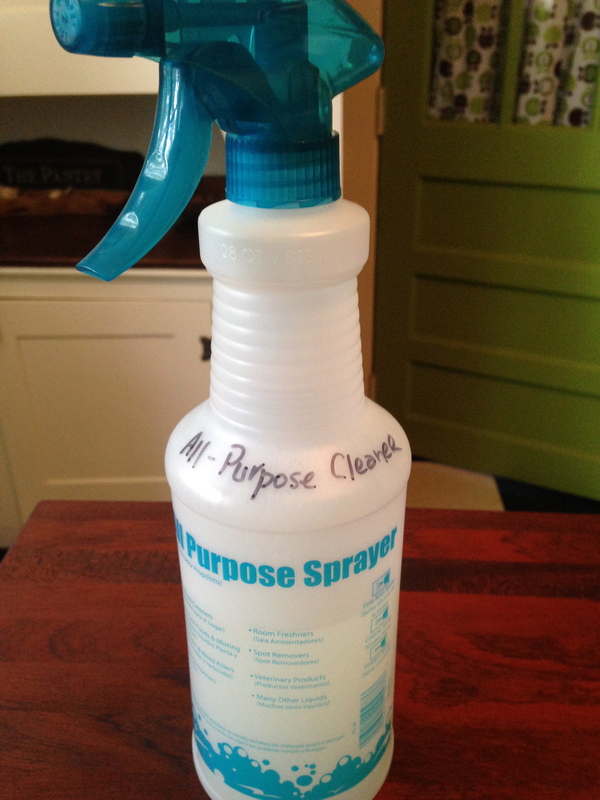 It’s a great addition to your green cleaning supplies. Use it as a disinfectant, on your tile grout, on your floors, or as a bleach replacement in your laundry. I’ve even poured it down our bathroom sink drain. Here’s a great article about using hydrogen peroxide as a cleaning tool. But I’m not giving up on my orange vinegar — it’s the best on a linoleum floor. The DIY era is generally considered a good thing, right? In this age of instant how-to information, anyone can do anything. And lately I’ve been wondering if that is a good thing. The running joke at the cottage is that it was wired by Joe’s Electric. And we laugh and say its a good thing Joe was Mr. H. C.’s dad, otherwise he would come in for a lot of criticism. Here at the city house we aren’t related to the painting crew that was here before we bought the house; consequently, the former owner has definitely been criticized. Several times. The painting crew must have been made up of ten year olds — nothing against ten year olds — and much of the other work done on the house was slipshod as well. But since I’m doing the painting, that’s what I’m noticing. Whoever painted the basement took a giant brush and five gallons of gray latex basement paint and slopped it over everything. Door knobs. Door hinges. Metal floor drains. Electrical outlets and the covers. The lock and chain on the door. Not to mention the concrete floor. There are slops, drips, and globs everywhere. Bristles from the brush left in the dried paint. Corners of trim left unpainted because it was, well, hard. And suddenly, it is my issue. If I just paint over the mess, now I’ve become the sloppy painter that I’m criticizing. And frankly? I don’t want the next owner complaining about me and my workmanship. 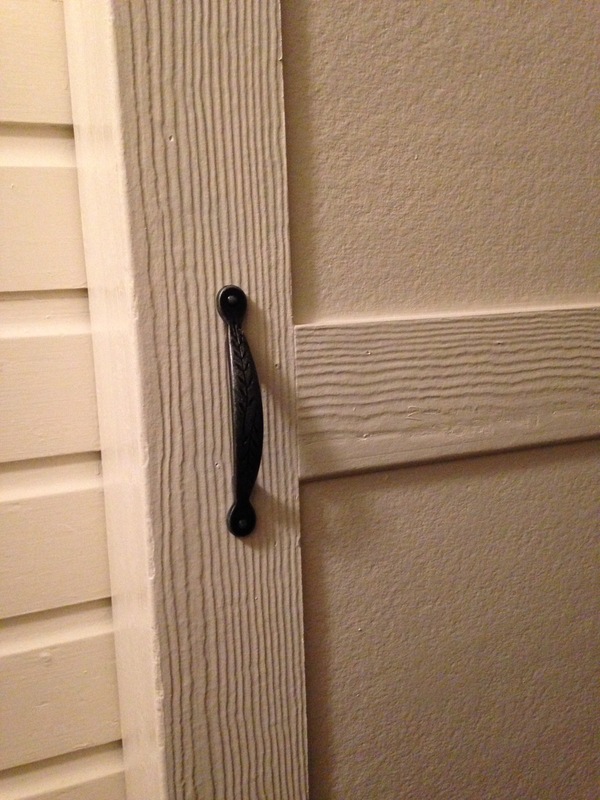 Any DIY-er knows to take off door hardware when the door is painted. Don’t they? Any DIY-er knows to never use latex paint on metal. Don’t they? Any DIY-er knows not to use oil-based paint on top of something already painted in latex. Don’t they? Any DIY-er knows to take stray bristles out of the wet paint before it dries. Don’t they? This is what worries me. What if the DIY trend is just acceptable mediocrity under the guise of pride in accomplishment? I’m a DIY-er from way back — I helped build my first house starting in 1978, before the first Home Depot even opened its doors — so I’m including myself in this. In the interest of saving money, or pride in accomplishment, or whatever else drives us to do it ourselves, are we accepting a lesser quality than hiring someone who knows how to do it really well? A few weeks back a blogger posted a photo of a coffee table she had painted. It looked lovely, though the photo was taken outside and there were shadows on the table. A professional furniture painter commented (very rudely) that regular people should not take on projects they can’t do. My chalk-painted chairs, $5 each from St. Vinnie’s, and painted with DIY chalk paint. I’ve done it. In fact, I do it all the time. Why should I pay someone else money when I might be able to do it? Do you think it might be part of our national character? After all, most all Americans came here from somewhere else because someone we’re related to thought they could do better themselves. As a recovering perfectionist (and married to one who is not yet recovered) I suggest that if a thing is worth doing yourself, it’s worth doing well. Mr. H. C. is a professional who has been called in many times to rescue homeowners who got in over their heads. And I think it’s great that they had the humility to admit they couldn’t do it. I wish the former owner of our city house had called in some professionals. When Mr. H. C. considers doing something sub-standard, he usually says, “No, it’s against my morals to do that.” I always usually smile when he says that, because, really? That’s the way everyone should work all the time. No matter what you are being paid, no matter who you are doing the work for, no matter how much (or how little) time you have to do the project. It should be “against our morals” to do sub-standard or sloppy or careless work.